Lease purchase trucking companies are very popular among drivers who want to become owner operators. 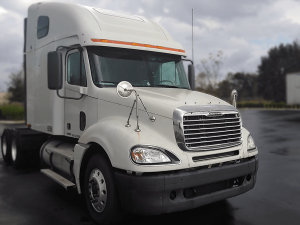 The reason for this popularity is because lease purchase trucking companies make it very convenient for drivers to buy their own equipment when they don’t have the money upfront or very good credit. It’s a great thing to have your own rig, but there are several things you need to consider carefully before committing to a lease purchase contract. One of the benefits of owner operator trucking is that you are pretty much free to call the shots. Company drivers go into owner operator jobs to make more money and have more control over their careers. As an independent owner operator, you have the freedom to decide which loads to take, how to run, what company to work with, and you also have more control as to how much money you can make. It is true that with more freedom also comes more responsibility, but compared to lease purchase trucking drivers, independent owner operators have more control over their business. The question is, do you have that same freedom or control if you buy a truck through a lease purchase program? Lease purchase companies claim drivers are immediately categorized as an owner operator and make more money, but who is really in charge? If you’re doing a lease, the payment for that truck is going to come out from your settlement every week, it doesn’t matter if you’re working or not. You may start making more money, but remember that you’ll also have more expenses. As an owner operator, you run your own business. You will have to pay for expenses you may not have considered before and on top of that, you’ll have to make that new truck payment. When you go into a lease purchase, they will hassle you to go out on the road as much as possible because they know that you have to pay for that truck. The lease purchase company will be taking deductions out every week and if you stay home too long you’re going to dig yourself into a big hole. So most likely they are not going to be very happy if you go home every weekend. On the other hand, as an independent trucker, you’re probably financed through a bank and you only have to worry about coming up with that payment once a month. You can go home for a couple of weeks and as long as you make the money to pay your payment you’re good. If you’re doing a lease that lease is going to obligate you to work more than if you did own your own truck. It’s a good thing to be organized and have the discipline to put some money aside each week to make that truck payment, but it is up to you as to how much and when to save up for your truck payment. A lease purchase truck is generally very expensive. Many times lease purchase trucking companies sell a truck for more than they could get if they traded it or got rid of it outright. They advertise having new trucks for you to lease, which are only a few years old, but being only a few years old it’s not a guarantee that it’s not going to be breaking down. What is guaranteed is that they are going to sell that truck to you for more than what it’s worth. We see this as too much of a burden on the shoulders of owner operators, for that reason we at Status Transportation we do not offer lease purchase programs. Depending on the company you go for they’re going to charge you a finance fee and interest rate which could be 10% or more. So they’re selling you a truck for top dollar, they’re charging you a higher interest rate than you would get through a bank. Not to mention that several other people may have leased that truck ahead of you and paid it down over and over again, and the company is still selling it to you probably for the same amount they sold it to three guys back. So they’re making a killing off drivers with the lease purchase truck. When buying a truck as an independent owner operator you can go out and find the truck you want. You have the option to choose the color if that matters to you, the name-brand, engine, transmission, etc. Whereas if you’re leasing a truck they’re going to take you out to the parking lot and they may have nothing but one brand, generally this is how it is at most lease purchase trucking companies. All of them look the same, the only difference between them is how many miles they got and how beat up they are. So you don’t really have a choice in the truck that you can get. That’s another comparison of leasing versus going and buying your own truck. The biggest difference between leasing a truck and going out and just buying a truck is freedom. The freedom it offers you to not be committed to that weekly deduction on a lease truck coming out of your check. If you go with an alright owner operator structured company they’re going to treat you a lot better than those mega carriers with all the company trucks. At Status Transportation we gather a lot of information from existing owner operators as to what the ideal trucking company would look like. Freedom is somewhat of very high importance to our business partners. 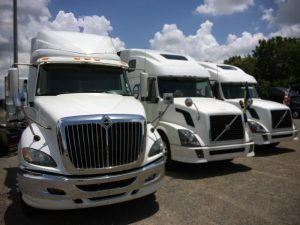 As a lease driver maybe you’ll have to pay for fewer things depending on the company that you go to, but chances are you’ll also make less money than an independent owner operator. So take your time to look around, ask questions, talk to other owner operators, get educated on how to calculate your cost per mile, and find an owner operator trucking company that will work with you towards your goals. For more information on owner operator jobs and trucking tips subscribe to the Status Transportation newsletter today!